THE ROTARY CLUB OF WESTMINSTER WEST IN DISTRICT 1130 IN THE UK. 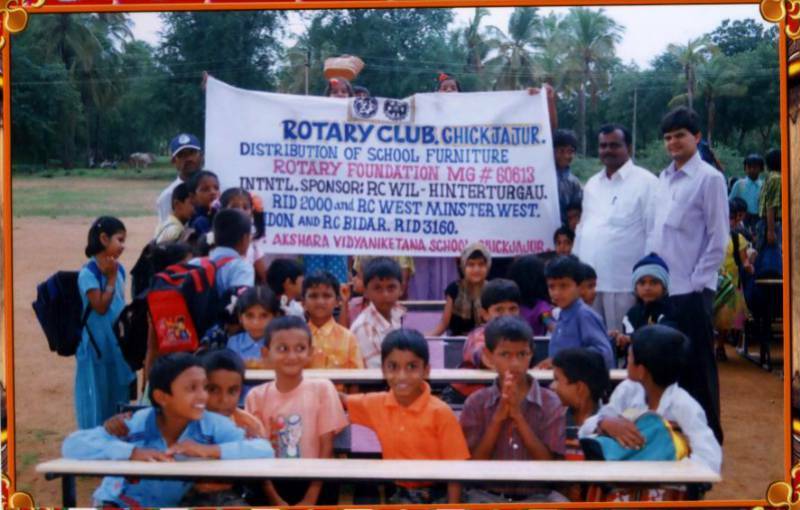 In late 2005, The Rotary Club of Bidar and the Rotary Club of Basavakalyan in RI District 3160 in Karnataka, India had identified the need to assist some rural schools in the Chickjajur area of their District. The Rotarians noted that many children in the villages and suburban areas were illiterate. Their parents were economically challenged and were unable to pay school fees, provide text and note books, as well as purchase school uniforms for their children. The Government provided the schools but many of these did not have proper furniture, lab equipment, or books. 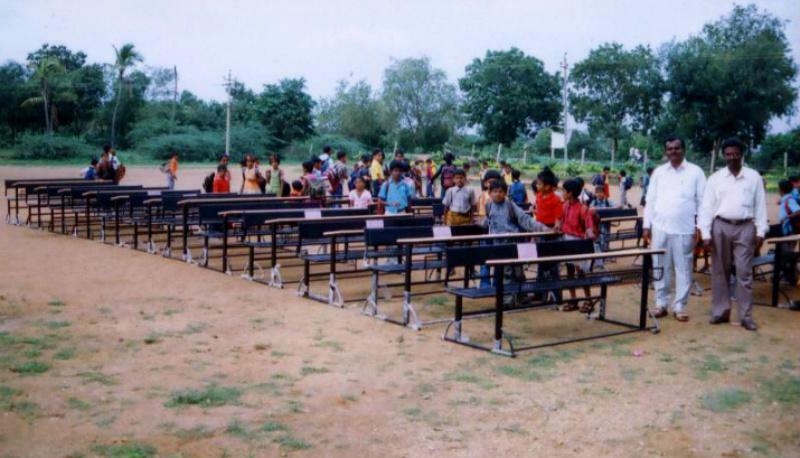 Thes economically challenged children were deprived of even basic access to school furniture. Some of the higher schools lacked laboratory equipment. Therefore the two local Rotary Clubs planned a project to provide these amenities to some schools within their District. 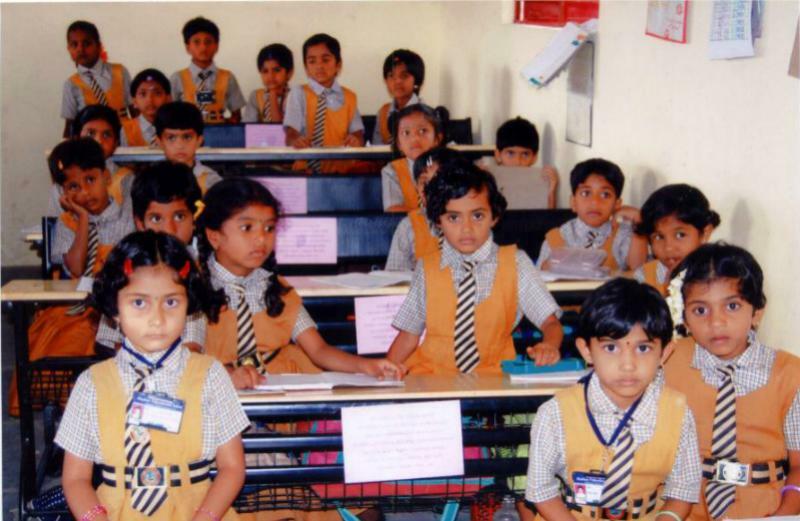 The two Rotary Clubs also identified a school in Guntakal where physically challenged children were studying. The parents of these children appeared to have almost abandoned them to isolation. Some volunteers in the district began running classes in a building for these physically challenged children. However, they faced a big challenge in transporting these children between their homes and school. The two Rotary Clubs decided to purchase a van for these physically challenged children. The two Clubs in District 3160 contacted the Rotary Club of Wil-Hinterthurgau (RCW-H) in RI District 2000 in Switzerland and invited them to join the project as an international partner. The RCW-H accepted this invitation and one of their Rotarians, Urs Hampy Halter-Savage, who is a honorary Rotarian of the Rotary Club of Westminster West (RCWW), requested the RCWW to join in as the second international partner. This invitation was accepted. The project began in April 2006 and was completed in March 2007. 1). The Rotary Club of Bidar would be the Primary Host Club and would assume responsibility for the Project and apply for a Grant from the Rotary Foundation (TRF). 2). A committee of two Rotarians, both of whom were Past District Governors (PDGs), from the Bidar Club were formed to oversee this project, namely PDG K C Senan and PDG Ravi Mulge. 3). A Project budget totaling USD$15,600 was agreed. 4). The four Clubs would pool their funds to raise USD$10,400. The remaining USD$5,200 would be sought as a Grant from the TRF. The application for the Grant was made by the Rotary Club of Bidar and this was successful. Members from the Rotary Club of Bidar and the Rotary Club of Basavakalyan participated actively in the project by identifying prospective beneficiary schools in the Chickjajur Area. They were involved in explaining to the beneficiary schools the importance of maintaining the items gifted. Members also played an active role in sourcing the required items and in negotiating the best deals for these. The two PDGs from the Rotary Club of Bidar supervised the project closely. They also kept regular contact with their local and international partners via email and telephone to appraise them of the progress made. The local Rotarians found that supporting schools at the rural level was welcomed by the local populace and administrators. They estimated that a total of two thousand one hundred (2,100) school children benefited from thIs project. The beneficiary Schools will own and maintain the property. An undertaking to this effect was obtained from the Schools to maintain all items provided in a satisfactory condition. The Schools also undertook to display the name of the sponsors including the Rotary Foundation wherever appropriate.